What I do recall is that we ended up somehow on a safari (sent by the government, I later found out, as a test of our walking Lightning Cannon) to hunt what people were calling a Demon Elephant. Not the many statued Ganesh, but an evil giant force bent on destruction. We investigated, taking our lightning cannon, a few tame elephants of our own, and some locals to help carry the many provisions needed by such a group. Everything I needed was in my ‘utility belt as I have come to call the bandoleer I wear, its pockets filled with herbs and various other mystical and not so mystical poultice ingredients, as well as a veritable pharmacopeia of pain killers, and hallucinogens. As we followed the path of destruction that is being wrought seemingly at random by this Black Lotus society, through the ancient cult of Kali, The Thuggees. I was drifting in out of the dream time, far more than anyone noticed, so wrapped up in the hunt, as most everyone was. We came upon a farm, that had once been a pretty place, that now looked like it had been through a typhoon or some other natural disaster. Reilly and I followed a trail into the nearby woods, hoping to set a trap, or draw out this so called rogue elephant, we thought, a Lycanthrope. Some poor soul, who like me, drank the milk and the blood of Kali. Was this to be my fate Rosie the Were Elephant, or Tiger. tiger, I could get behind, but I knew that whatever transformation was being wrought upon me, was more thoughtful than that, and I knew that I was guiding the slow transformation, putting my own unique mix of Egyptian, Mayan, and Outback dream sculpting upon it. Kali may have seeded me, but I have done the pollination. I was daydreaming of a Kangaroo, or a Croc, but neither of those creatures are masked, in story, or reality. While this was going on, the Lady was taken away by some kind of Monkey God, or stabler than we have met, Were-Monkey. He warned her of many great dangers, that will be wrought by her weapons and those who covet, and or oppose them. I imagine the Lady rolling her eyes, and being polite about it, but she’s pretty dead set on selling off these mechanical walking guns to the Army. We found the destroyer of farms and whatnot, it was a Lycanthrope, but not of the Elephant Variety, this grey beast man had a horn extending from his nose. He was a Were-Rhino. Oswald, and Reilly managed to shoot him with the cannon enough times to take him down, but not before he was able to pierce the hull of the mecha-beast with his pretty impressive horn. We knew he was dead when we found the charred corpse of a person in the crater that the gun made with it’s lightning. I think that our mechanical Unicorn riding helped to kill the Lycanthrope, I keep forgetting his name, despite how handsome he can be astride that metal not quite a horse, Collier? no, no, Colin Miller, Lieutenant. Must remember. I think I have misnamed him the few times we’ve spoken, he is always concerned for my modesty, as I am liable to ruin every outfit the Lady buys me. I overheard one of the servants say I was naked more than a newborn baby. He said this while walking past me, likely thinking I wouldn’t understand his dialect. I answered him, that it was true, and that clothing is a burden to people where I come from. He ran away to the back of the parade we were making through the edge of the jungle. I was trying to rest my mind and spirit and in a trance that no one, even those adept at noticing such things, did not notice. Such is my skill with trances, and potions to induce such things. Of course, no potion was needed for me to feel, the further we walked, closer and closer to ‘Maya’ the temple girl, who is becoming less and less a temple girl, and more and more an aspect on Earth of the Hindi goddess Kali. I felt pulled, guided towards her. My hopes of saving what little of the girl remained, were slimming as the Heart of Kali was beating with my own heart, and if they had been listening, the hearts of everyone in our troupe. We had just found about half of our retainers, and none of our own elephants when we heard a great thunderous something, maybe an army crashing through the bush towards us. It turns out that while we repaired (Oswald the Promethean, and Rilee) and the rest of us searched for our pack animals. The heart of Kali overwhelmed me and any consciousness, I might of had left, and my transformation started in earnest, as I felt in every cell of my body, and mind all the rage of Maya, and of Kali, as her own transformation hurtled at us in the form of the biggest Were-beastie we have encountered yet, a were-elephant, that was the size of two pachyderms or more, stacked one on top of the other. It raged past us in a blur too afst for something so large. I was having a harder and harder time distancing myself from the dream time body that has been trying to manifest inside me. I recall fighting, or being hit by something or someone, and while I was almost about to finally transform, Quaid, our resident Irish Vampire bit me in the arm. I transformed finally into the being my dreamtime had become. 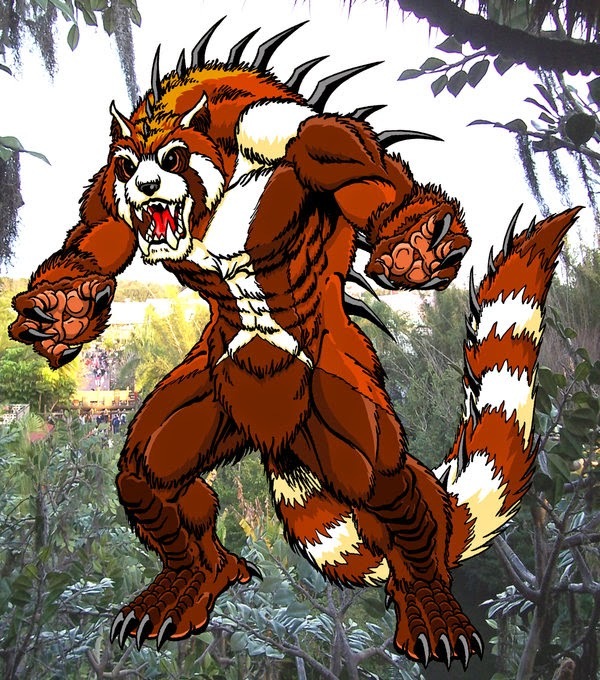 I was a fearsome Were-Red Panda (misnamed creature who is obviously a raccoon of some sort) I include a fanciful drawing made by one of my companions who keeps their drawing ability a secret, so I won’t name them. I really don’t have those weird stegosaurus barbs, though. Another thing that surprised me other than becoming a creature I had never heard of until I became one, was that in this form I am genderless and speechless. I wrapped my brain around that by imagining that it is the ‘possessed doll’ version of myself. Though i don’t say it to anyone else, as when I said that to my compatriots, it made them feel creeped out. But it gives me equilibrium to think of myself thus. I have abilities you might expect(and knew instinctively how to use. I am still immune to poison, and can understand (and could write had I opposable thumbs.) all languages. I feel like the longer, and more often I inhabit the ‘doll’ I will be able to train myself to speak, but for now I have to try to communicate with my friends through racconish whistles and growls, and a lot of leaping and pointing. All the ‘civilians’ who hadn’t yet fled, did so as we all (except me who was in mid transformation, and part of the rage) gasped and wet ourselves just from seeing and hearing this obviously pained Leviathan charging towards us like English Noble Women at a hat sale in old London Town. Maybe, even more ferocious than that. I jest to relieve my own tension at just recalling all that rage magically transforming a man into a beast that defies all logical thought. No one would have thought less of any of us if we had also ran from the gargantuan beastie, but of course we are a jaded fearless band who have seen more than this, been more than this. Having barely repaired their weapon, Railey, and Oswald fired at the ground just in front of the thing. When the dust settled, the creature had fallen in to the crater and was momentarily stunned, and the machine had it’s way with the creature that perhaps only I with my connection to Maya, and Kali, really felt sorry for. At least until once again, we left a charred Indian corpse in our wake. We made enough noise to bring forth the Calvary, or at least one of the most Pompous and ridiculous Scotsmen I have ever met, a Sir Stanley Fitzpatrick. His wonderful red sideburns aside, he came across like every other petty bureaucrat who thinks themselves a Lord or a Lady of some sort, that I’ve met across the globe, or on Mars, that time. He would have been more interesting had he thought himself a Lady. Lip colour on a pig and so on, I think Shakespear said. He guided us to his castle with all the fake magnanimity he had at his disposal, and I felt the heart of Kali in each of our footsteps, as we got closer to the girl, and the Goddess. By the time we got to the huge appropriated castle of Lord Fitzgerald, and his sideburns, I had managed to change back to a more naked than usual Rosie form. The only things that didn’t bust off of me were the giant bloomers I was wearing, and my loose fitting ‘utility belt’, which I will need to make even looser if I want not to shred that too eventually. We went into the main receiving hall, obviously a ‘throne room.’ A beautiful young man was introduced to us as the local Raja, or Prince of the region. It was pretty easy to see that he knew courtly manner, and was teeth scrapingly deferential to Sir Blowhard MacSideburns, He and the lady exchanged some looks I meant to ask her about later, but never got around to. After some tea and time to clean up from our ordeal/adventure, we were shown to our rooms, deep within the compound. Its like they knew we would be sneaking around trying to find the heart of Kali. Of course as we were all settling in, and/or making plans to yet again forgo sleeping to snoop around the castle we were ‘trapped’ in, that The Heart of Kali started beating so loud, I was sure the most mundane folk could hear and feel it. The air, and my brain were electrified with Kali’s rage and maya’s weakening resistance. Able to get myself into a bit of a Trance as my transformation seemingly again forced itself upon me, I was able to tap in, feeling some force of Lycanthropes would soon be upon us. Taken over eventually by the Blood rage of Kali I felt myself pulled into the hall where instead of rushing into Riley’s room next door, I raced out, in Red Panda form, and was promptly shot in the shoulder by the aforementioned Agent Reilley. This had the effect of knocking me back to my own consciousness and i was no longer trapped in Kali’s dreamtime. I transformed back to myself, after my Panda form was able to absorb most of the damage from the bullet. I am tough in that form, which is going to be so useful, once I can control the transformation a bit faster. Of course I was once again naked. Also something to work on. There were some screams from the inner courtyard. Quaid, having gotten high and susceptible to the Heart of Kali was in his own bloodlust and trying to take a chunk out of the Lady. Oswald Amadeus used all his Promethean strength to stop the Irish vampire from biting anyone other than himself, and his ‘blood’ is anathema to vampires. Apparently it tastes of battery acid. I’m not sure I would be licking any batteries. No who am I kidding, I’ve licked toads in the Outback, of course I’d lick a battery, especially if it had some side effect other than tasting horrible. I dashed across the rooftops like a Chinese acrobat high on performance enhancing magic beans. It’s really a thing, I saw some of them travelling across the outback in a horseless wagon that looked like a Chinese Junk. I always wished I’d been able to get some of those beans, but now I am the beans, and the only side effect so far seems to be susceptibility to the will of Kali. I know we can fix that. I saw that there were a dozen Tiger men coming fast upon the castle. Riley raced back inside and used his spy know-how to build some sort of bomb on the door that the Tigers would be forced to use to get to us. Then we decided, that once we all took a few minutes and were able to resist the jungle drums of Kali’s heart, that beat so loud, that whether I was naked me, or the sexless Panda me rang in my ears like the wind blows on your face. I grabbed a sari from somewhere, hoping not to shred it when (not if) I had to transform into Panda form again. As we were descending, we heard the door frame and the tigers explode. I almost felt bad for the poor souls, I made a mental note to have a proper ritual to help cleanse the Anger of Kali, from those she sacrificed to make herself present on the Earthly plane. We followed the heart of Kali into of course the basement, and tunnels, always tunnels, at least so far these tunnels were reasonably excrement free, unlike most of the sewers we visit to stop creatures and villains from destroying whatever it is they are bent on destroying. If i hadn’t spent much of my childhood being lowered into tunnels that grown folk could not fit into, I might be claustrophobic. There was also that time I lived with the Alligator people in ancient tunnels under the great Amazon River, but that’s a loooong story, without any kind of resolution other than my escape. I still dream of Alligator snouts breathing on my neck. We find the cell fairly easily and find that the prisoner, who looks to have been down here for quite some time, is being not so slowly drained of his blood by a ‘leech’ almost as big as an alligator person. We manage to kill the leech and grab the man away. There is a hole below his cell where more leeches will come from, so we seal that up in our usual clumsy way that will give our location away. As we helped the man recover from his injuries, The Lady gasped in horror, as she realized somehow that the fellow we had saved was her Husband, the Lord westmoreland, who, the Lady had killed herself, obviously not public knowledge, that bit of information. She saw that it was Lord westmoreland, despite the fact that he was inhabiting the body of some ‘Super Sargent,’ a one man battle unit, that everyone except me had heard of. With that rather big news, we all felt a bit stunned, and almost forgot our mission, as always that was the moment that the excrement we had been avoiding hit the proverbial fan.